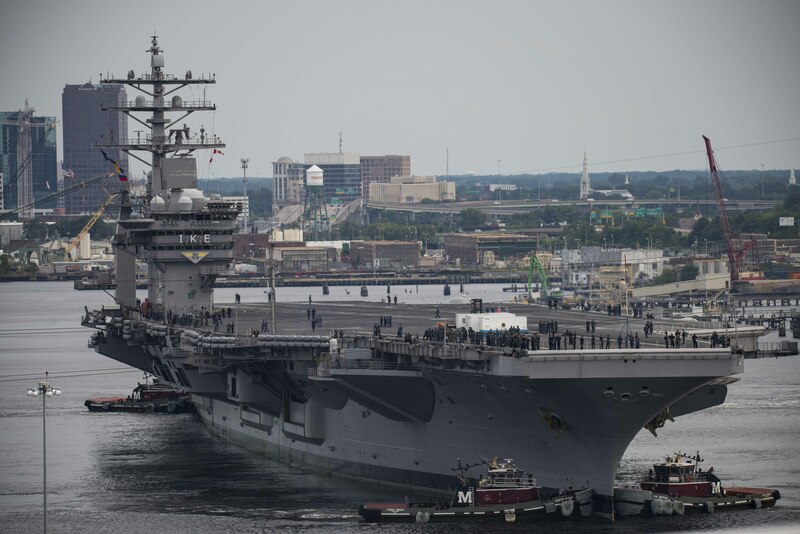 Aircraft carrier USS Dwight D. Eisenhower (CVN-69) has departed Norfolk Naval Shipyard and is returning to Naval Station Norfolk to complete the remaining months of work on its long-overrun maintenance availability there, USNI News has learned. The carrier entered the maintenance yard in August 2017 and was expected to complete its planning incremental availability (PIA) by February 2018. Instead, as USNI News previously reported, the ship’s age and demanding deployment schedule in recent years caught up with it. For the second time this decade, the carrier overshot its planned maintenance period by 10 months or more. “This is a 41-year-old-ship and much like a vintage car, there are always things we can’t anticipate,” IkeCommanding Officer Capt. Kyle Higgins wrote in a Sept. 22 note on the ship’s Facebook page. The note has since been deleted. 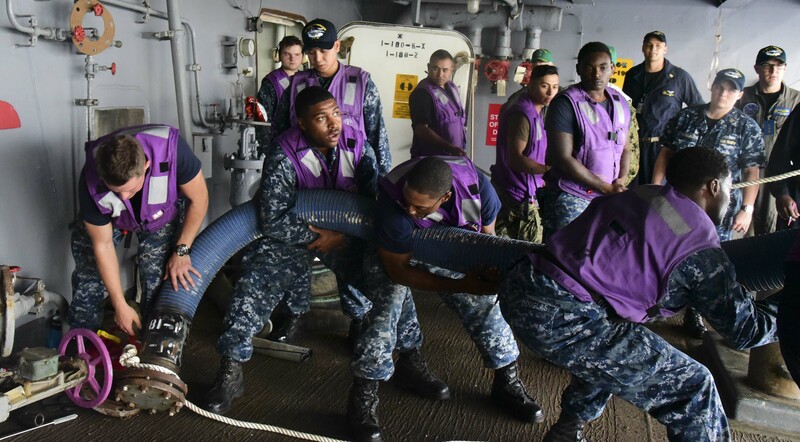 Now, the Navy has made the decision to get the ship and its crew back to homeport – a decision that will not affect the timeline of the remaining repairs, but may save some money and will help the crew regain a sense of normalcy as they prepare to enter the basic phase of the Optimized Fleet Response Plan. “The remaining PIA work does not require the ship to remain at Norfolk Naval Shipyard. The decision was made to move the ship back to Naval Station Norfolk where the crew can focus on the next phase of preparations leading to deployment,” Naval Air Force Atlantic spokesman Cmdr. Dave Hecht told USNI News in a statement this morning. 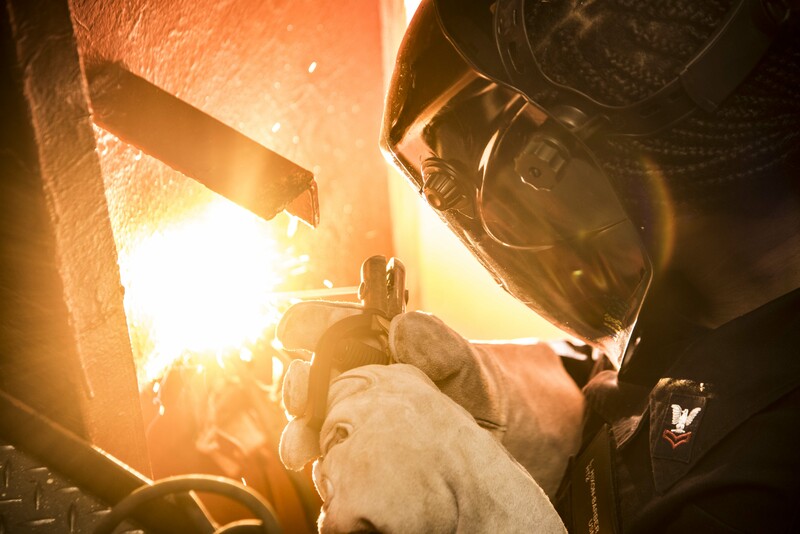 Hull Maintenance Technician 2nd Class Lashavya Barber welds aboard the aircraft carrier USS Dwight D. Eisenhower (CVN 69) on February 15, 2018. Eisenhower is undergoing a Planned Incremental Availability (PIA) at Norfolk Naval Shipyard. US Navy photo. The remaining PIA work will be done by both the carrier’s crew and by Norfolk Naval Shipyard personnel, who will travel from the repair yard in Portsmouth to the nearby naval station in Norfolk. Hecht said personnel routinely travel between the two locations to work on ships. “This is a win for the ship, allowing them to somewhat get back to business, while also being a win for NNSY which will not incur any additional costs by completing testing at Naval Station Norfolk,” he said. “We are on the path to head back to sea and as a result our workload continues to increase. We have steam plant testing, dock trials, fast cruise and sea trials on the horizon, all leading us back to Naval Station Norfolk,” he wrote. That schedule of events will still take place, but the test and certification activities will take place out of Naval Station Norfolk, whereas a carrier would usually remain in the maintenance yard until that process had been completed. Sailors aboard the aircraft carrier USS Dwight D. Eisenhower (CVN 69) pull aboard a refueling hose on Aug. 21, 2018. Dwight D. Eisenhower is undergoing a planned incremental availability at Norfolk Naval Shipyard. US Navy photo. It is still unclear when exactly the PIA will wrap up – the Navy has only said early 2019 – and yet to be determined when the ship will conduct its next deployment. Also still unclear is what Ike’s delay means for other aircraft carriers. It is likely that USS George H.W. Bush(CVN-77) will be the next to go into the yard, based on the Atlantic carrier fleet’s recent deployment schedules. Hecht told USNI News that the decision to move Ike out of the public shipyard was not due to a need to open up space for a new carrier to come in.